The Flavors of Philly Tour is great for out-of-towners! Terrific value--Philly history AND full lunch rolled into one great adventure. Features cheesesteaks, tomato pie, soft pretzels, and 2 desserts at the iconic Reading Terminal Market. Public Tours are not offered during our winter break from November 1, 2018 through February 29, 2019. Discover Philly's most popular food favorites while getting a taste of the city's rich history and culture! 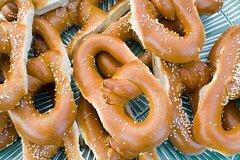 Eat like a local on this fun, casual, Philadelphia themed tour that all of 'youz' are sure to enjoy! This delicious and entertaining tour takes place in the heart of Philadelphia and includes 5 stops. Make room: this is not only a tasting adventure, but a meal that includes classic Philly eats like cheesesteaks and cheese whiz fries, tomato pie, soft pretzels, and two sweet treats from the world-famous Reading Terminal Market! Get the scoop on Philly’s food history with quirky stories about how some of these iconic foods came to be, and walk away with food in your tummy and some insider tips about the best places to eat like a Philadelphian. This one-of-a-kind tasting experience brings you to where the locals really eat—low-key, no-frills, independently owned gems that share the uniquely unpretentious vibe of the city. In addition to some first class sightseeing, you’ll visit an authentic mom-and-pop pizzeria, a soft pretzel bakery, the historic Reading Terminal Market and much more. This tour is served up with a generous side of humor, Philadelphia history, and a helping of beautiful architecture that includes an up-close look at City Hall—the second-largest government building in the country! We’ll keep you off the tourist beat, introduce you to places locals love, and immerse you in the culinary experiences that have made Philly foods world-famous. Not designed for children under the age of 5. Contact us for private tours for children. Content and Schedule subject to change without notice. **In rare circumstances tours may be cancelled due to low attendance. Tours are not offered during our winter break from November 1, 2018 through February 28, 2019.